On May 22, 2014, the Subcommittee on the Middle East and North Africa of the Committee on Foreign Affairs in the House of Representatives of the U.S. Congress conducted a hearing. The hearing was the Congress’ first-ever on The Gulf Cooperation Council (GCC). The title of the hearing was “The Gulf Cooperation Council: Deepening Rifts and Emerging Challenges.” The hearing examined the implications for key U.S. foreign policy objectives and developments in America’s strategic relations with the GCC countries. The GCC is a six-nation alliance comprised of Bahrain, Kuwait, Qatar, Oman, Saudi Arabia, and the United Arab Emirates. Among the issues the Subcommittee discussed were various frictions among the GCC countries that have surfaced in recent months, the policy differences between some of the members and the United States with regard to Egypt, Iran, and Syria, and the potential, once Americans reach a greater degree of self-sufficiency regarding their energy requirements, for a waning of U.S. interest and involvement in the GCC region. National Council on U.S.-Arab Relations Founding President & CEO Dr. John Duke Anthony, who also serves as Secretary of the U.S.-GCC Corporate Cooperation Committee, submitted the statement below for consideration by the Subcommittee. Dr. Anthony is the only American to have been invited to each of the GCC’s Ministerial and Heads of State Summits since the GCC’s inception in 1981. Madame Chairwoman Ros-Lehtinen, Ranking Member Deutch, and Distinguished Members of the Subcommittee, thank you for the opportunity to submit a written statement for the record. I commend you, Ranking Member Deutch, and your fellow Subcommittee Members for your and their interest in what is arguably one of the least understood and most misunderstood sub-regional organizations on the planet – the Gulf Cooperation Council (GCC). I am pleased to be asked to identify GCC-related opportunities that are largely overlooked by the rest of the world and especially by many in the United States. Among these opportunities are ones that will continue to have an extraordinary impact on U.S. national security, economic, and geopolitical interests and the interests of America’s allies worldwide. Such an opportunity is the little known but growing and increasingly formalized American relationship with the six GCC member-countries of Bahrain, Kuwait, Oman, Qatar, Saudi Arabia, and the United Arab Emirates. Let me be forthright and state at the outset. This opportunity has come about as a result of the multifaceted range of the cooperation between these countries and the United States since the GCC’s establishment in1981. Much the same can be said about a similar range of benefits that have accrued to the GCC countries during this period from the multifaceted range of their cooperation with the United States. The context for my statement about the U.S.-GCC relationship is my privilege of having been the only American invited to attend every one of the GCC’s annual Ministerial and Heads of State Summits since the organization’s formation 33 years ago this month. In addition, since 1986 until the present, I have had the personal privilege of accompanying, at their request, more than 200 Members of Congress, their chiefs of staff, defense and foreign affairs advisers, and legislative and communications directors on fact-finding missions to the Arab world, with a particular emphasis on the six GCC countries. The GCC member states are hardly marginal to the overall strength, health, and material wellbeing of a large swath of humanity. For example, the GCC member-states represent one third of the world’s proven hydrocarbon fuels, one fifth of the world’s natural gas, and an increasing percentage of the world’s petrochemicals. Their proven oil reserves alone are more than 15 times the proven reserves of the United States. In addition, the GCC region hosts the 130-nation developing world’s top four sovereign wealth funds. Moreover, in the last three years, Saudi Arabia and the UAE have alternatingly ranked first among all the world’s purchasers of America’s state of the art defense structures, services, systems, technology, ammunition, equipment, training, security assistance programs, and maintenance valued at more than 100 billion U.S. dollars. In this regard, it needs to be emphasized that this represents an immensely important boost to the U.S. economy, job creation, the extension of production lines, lower per unit costs, and the standard-of-living of millions of Americans, their families, and untold numbers of local communities throughout the United States. No other segment of the developing world comes anywhere near this magnitude and diversity of scope in being a partner of such significance to the United States in the areas of trade, investment, and the establishment and administration of profitable joint commercial ventures. That so few Americans are aware of these truths is lamentable. However, the fact that this committee is conducting a hearing on the GCC should do much to begin to remedy the situation. If so, both sides would stand to benefit immensely. So too would the broader region and the world in general. A little known reason is that the domestic security and stability of these countries for the past quarter-century has been unmatched by any other six neighboring states in the developing world. Moreover, despite the turmoil introduced by the so-called Arab Spring that commenced in late 2010-early-2011 in several other Arab countries, this particularly distinctive vital part of the world has largely been an important exception. But one among other reasons is that, in close cooperation with the 35,000 American forward deployed armed forces and notwithstanding grave exceptions over their respective policies toward Egypt, Iran, and Syria, the GCC countries as a whole have remained rock solid in their support for a range of joint GCC-U.S. strategic objectives. In the process, such positive results as have occurred in Afghanistan and Yemen have benefited greatly from the GCC countries’ leadership initiatives. 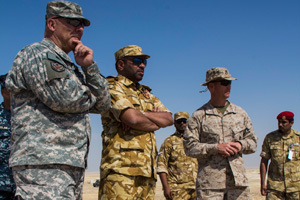 U.S. military officers discuss training with Qatari Emiri Land Force officers during Operation Eagle Resolve 2013, an annual multilateral exercise designed to enhance regional cooperative defense efforts of the Gulf Cooperation Council nations and U.S. Central Command. 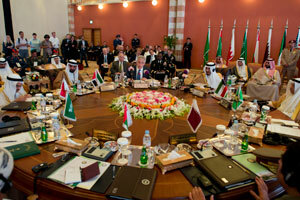 In addition, particularly noteworthy has been pan-GCC support for U.S. counterterrorism objectives and energy security. Also noteworthy is the ongoing GCC support for the strength of the American dollar in which the exports of all six countries continue to be denominated. Not least among the reasons is that such support has helped to sustain the ongoing preeminence of the dollar in international financial transactions, which remains key to the strength of the American banking and investment systems worldwide. And regarding energy security, it is significant that since 1974 these six energy producing and exporting countries have delivered every single barrel of oil promised to their buyers. In so doing, they have contributed mightily to the engine that drives world economic growth. Let there be no doubt about the implications for key American foreign policy objectives for the GCC and the U.S.-GCC relationship. The GCC and its members arguably have represented and will continue to represent an opportunity for a close, multifaceted, and mutually beneficial strategic partnership with the United States as they have from the beginning of the GCC’s establishment in May 1981. Certainly, the region that the member-states inhabit, then as now, has been the one area more than any other on the planet to which the United States has mobilized, deployed, and led an internationally concerted coalition of the world’s armed forces not once but three times in the last quarter-century. Even so, and despite the GCC countries’ leaders wishing it were otherwise from the outset, and despite also the European Union and its member countries taking advantage of the opportunity practically from the organization’s formation, the United States has been slow to capitalize on numerous facets of the strategic opportunities at hand. Now, however, this has largely changed. At least on the economic and strategic fronts as they relate to America’s and the GCC’s joint quest for greater regional and global security and stability, and the respective potential for increased prosperity at both ends of the relationship, something new is afoot. What exists now is the end of an error and the beginning of an era quite unlike any before. A major turning point in this regard occurred in October 2008. At the time there was the impending U.S.-housing market insecure mortgages-induced global international economic, financial, credit, and liquidity crisis. It so happened that I was in the region then. So, too, was the then Deputy Secretary of the U.S. Department of the Treasury. The latter was on a little-publicized but highly significant official visit to four GCC countries. The purpose of the Treasury official, with a metaphorical begging bowl in hand, was to request what the United States had so frequently and successfully been able to obtain in times of earlier major financial need, namely various kinds of thinly-disguised economic bailouts. The use to which Washington officialdom intended to put such bailouts was unmistakable: to tide the world’s largest but also most indebted economy over until what, based on past experience, could be the next international financial crisis or moment of extraordinary official American material need. But while the American envoy was received cordially and respectfully, in keeping with the norms and rituals of pan-GCC respect and custom, the nature of his reception was in another way profoundly different. In effect, one after the other GCC country official served notice that no longer would their ministries of finance and economy be as willing as in the past to come to the rescue of an impending American fiscal, monetary, or other debt-related predicament. From then until now, the GCC economic and financial leaders have demanded practically in unison what all along has been their right. This is that if they were to extend anywhere near as massive a degree of assistance as before, the way forward would have to be different. That is, they would provide serious and favorable consideration to assisting the United States this time around only if, figuratively speaking, they could be present with America not only on any economic crash landings but also on the takeoffs. Group photo of the 2010 G-20 Toronto summit leaders. President Barack Obama is next to Saudi Arabia’s King Abdullah in the front row on the right. Beginning in March 2012, at a meeting in Riyadh, Saudi Arabia and building on the years-old Saudi Arabian-U.S. annual rounds of strategic dialogues, there have now been, for the first time, a series of U.S.-GCC strategic dialogues. Each has covered practically every major aspect of the two sides’ respective needs and interests pertaining to security and stability issues as well as related areas of mutual economic concern. In this regard consider the following. In December 2013, U.S. Secretary of Defense Chuck Hagel in an address to an international strategic security forum in Manama, Bahrain reassured America’s GCC friends, allies, and working partners that, despite periodic misleading American rhetoric to the contrary, the United States remains fully and firmly committed to the goal of deterring any threat, attack, or intimidation against any of the GCC countries and to their defense should deterrence fail. Embedded in the Secretary’s address was a statement that the United States will endeavor to do the maximum to enhance the defense capabilities of the GCC countries. U.S. Secretary of Defense Chuck Hagel speaks at the Gulf Cooperation Council Defense Ministerial Meeting in Jeddah, Saudi Arabia May 14, 2014. Madame Chairwoman, it is important to note that just last week Secretary Hagel carried through on his promise when he met with all six of the GCC’s Ministers of Defense in Jeddah, Saudi Arabia. He did so in the context of the recently established GCC Joint Defense Council. Had the Secretary been seeking credible evidence of the pan-GCC resolve to enhance the member-states’ self-defense capabilities, his visit and the timing of the Defense Ministers’ gathering could not have been more propitious. Indeed, he arrived on the heels of the six countries’ joint military maneuvers that had just been conducted in the kingdom. The number of participating Saudi Arabian troops alone were reportedly more than a record 130,000, with special observers from Pakistan, Turkey, and other nations attending. Lending credibility to the goal of enhancing the member-states’ deterrence defense capabilities on the occasion was Saudi Arabia’s display of an advanced version of the Chinese-manufactured CSS-II long-range missile with a capability of reaching Tehran. All of this can only lead one to conclude that the globally strategic goal of ensuring the security and stability of what is arguably the most strategically vital corner of the earth cannot be dismissed as insignificant or business as usual. What all these developments mean is several things. First, the GCC countries’ demonstrating a degree of significantly heightened resolve to strengthen and expand their deterrence and defense capabilities in and of itself ought to be welcomed by the American taxpayer. A reason is that it shows the requisite determination by America’s GCC partners to utilize the maximum of their own resources, combined with ongoing American security assistance, to accomplish a goal of vital strategic importance not only to themselves and the United States but to their and our respective friends, allies, and respective working partners. 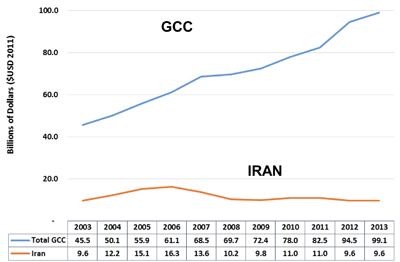 Total military spending in billions of dollars ($USD 2011) from 2003-2013 by the GCC countries compared to Iran. Source: “Evolving Threats and Strategic Partnerships in the Gulf” Report by Dr. Anthony H. Cordesman, Center for Strategic & International Studies, April 30, 2014, compiled from Stockholm International Peace Research Institute data as of April 8, 2014. Madame Chairwoman, let there be no confusion or mistake as to what is in play here. What is in play is the prospect of the GCC countries and the United States jointly contributing to a meaningful and enduring system of regional order and peace. Such an order, if it can be attained and sustained, stands to benefit not just the citizenries of the GCC countries but their neighbors, America, and the rest of the world. Second, these developments should by now make it abundantly clear that there has not been and there is not likely to be any precipitous pivot by the GCC countries away from their respective decades-old reliance upon an overall American-led defense umbrella. This, too, ought to be reassuring to Americans who have understandably grown weary of strife and turmoil not within the GCC countries themselves, where such phenomena have been largely absent or minimal, but, rather, on their borders and in nearby areas. The effect of this American malaise has for too long been a source of confusion and uncertainty among would-be U.S. investors and potential business partners in these countries’ economies. Third, the recent illustration of dynamism within and amongst the leadership circles of the GCC countries should also be welcomed and supported. In this regard, one need only recognize and appreciate the positive leadership role that GCC countries manifested in the cases of Libya and Yemen. In the former, their roles complimented NATO’s involvement. In the latter, their diplomatic engagement and effective mediation was vital to the peaceful transition of Yemen’s government. Not least amongst the results of these positive trailblazing initiatives by the United States on one hand and by the GCC countries on the other is how the two efforts together have helped to restore a measure of the once-omnipresent historic goodwill among the GCC countries’ citizens towards the United States and vice versa. What few Americans are aware of in this regard is that the first Western nurses, doctors, and teachers in this region were American missionaries who long before oil and air conditioning came not to proselytize but, rather, to live lives of exemplary service to the peoples of Arabia and the Gulf. Beyond the offering of these observations for the purpose of better American and especially Congressional understanding of the GCC and its member-countries, one must take care not to overlook or fail to appreciate something else. This is the unprecedented 22 League of Arab States Members’ unanimous endorsement of Saudi Arabian King Abdullah’s March 31, 2002 peace overture to Israel. Until this day, 12 years later and counting, the entire Arab world awaits a positive response. Not only would a peaceful resolution of this conflict provide Israel with the peace and security that its founders sought and their successors to this day continue to seek. It would also end the suffering, humiliation, and dispossession of the Palestinian people. In this regard, there should be no mistake that the continued unjust and inhumane denial of the Palestinians’ legitimate rights and aspirations to their freedom, national sovereignty, and territorial integrity remain at the center of the longest, most massive, and pervasive obstacle to Israeli-Arab and American-Arab-Islamic relations. In pointing out such little known facets and facts about the Gulf Cooperation Council, its member countries, and the region in which it is situated, I hope that the information and insight contributed to the proceedings of this important hearing will in some way enhance not just American awareness of this little known sub-regional organization and its peoples. The hope is also that what I have offered will help strengthen American knowledge and understanding of this institution and its members. Certainly, it cannot be denied that the GCC has for too long been invariably ignored, derided, and dismissed as a vital partner of the United States and our respective peoples’ legitimate quest for an incredibly important part of the planet that is secure, stable, and economically prosperous. Yet in the absence of a greater degree of the requisite trust and confidence between the GCC countries and the United States than has existed in recent years, one thing is for sure: there will not only be the absence of peace for our respective peoples. There will also be precious little in the way of prospects for our long run joint prosperity. Indeed, what could be achieved in the absence of heightened trust and confidence between our governments and citizenries would remain severely limited. In stark contrast, however, what could be achieved with deepened trust and confidence between us would be limited only by the imagination. Madame Chairwoman, Ranking Member Deutch, and Distinguished Members of the Subcommittee, I congratulate you and your colleagues for convening this hearing. These proceedings have great potential. Not least is that they should provide an opportunity to forge a firmer foundation for our two peoples’ continued cooperation in the challenging period ahead. Along with the National Council on U.S.-Arab Relations and the U.S.-GCC Corporate Cooperation Committee, I stand ready to provide my fullest support and assistance for your efforts. The Saudi-US Relations Information Service (SUSRIS) is an independent, private-sector information resource that offers objective, comprehensive news and information on the history, breadth and depth of the US-Saudi Arabia relationship. SUSRIS was launched with the support of the National Council on U.S.-Arab Relations, which served as SUSRIS’ publisher of record for the first years of its existence. Dr. John Duke Anthony is the Founding President and Chief Executive Officer of the National Council on U.S.-Arab Relations. On June 22, 2000, on the occasion of his first official state visit to the United States since succeeding his late father, H.M. King Muhammad VI of Morocco knighted Dr. Anthony. The Moroccan monarch and head of state bestowed upon Dr. Anthony the Medal of the Order of Ouissam Alaouite, Morocco’s highest award for excellence. The only American to have been invited to attend each of the GCC’s Ministerial and Heads of State Summits since the GCC’s inception in 1981, Dr. Anthony is a member of the United States Department of State Advisory Committee on International Economic Policy and its Subcommittee on Sanctions. This entry was posted in Gulf Cooperation Council (GCC), John Duke Anthony, US-Arab Relations.